Hi ya’ll, Lexy here again! I love the holiday season more than I could even explain. Though, there always comes a point in my holiday shopping when I am stumped on what to gift someone. This, is when Super Cute comes in. I want to tell you all about our amazing Lizzy James bracelets, as they are the perfect gift that special person in your life is for sure to love and appreciate. Lizzy James is a jewelry company. While courageously battling breast cancer, Lizzy put her energy into producing unique artisan jewelry. Lizzy created wrap bracelets that can double as a necklace. She wanted to make something both creative and practical that people were sure to love as much as her. This company is made of love and creativity, and truly inspiring. These wrap bracelets come in a variety of sizes, colors, and designs so everyone is sure to find one that they love, and that truly speaks to them. I love that Lizzy James wrap bracelets are so versatile and very different from anything else. Lizzy James would make the perfect gift for the person who probably has it all, who needs a little sparkle in her life, or just as reminder that they are loved. You are sure to find a bracelet the special woman in your life will love; whether she is an animal lover, appreciates a classic piece of silver jewelry, or likes to dawn her Freeland colors wherever she goes. Be sure to finish off your Christmas shopping this week with us at Super Cute and pick out your Lizzy James bracelet today! Hi everyone, Lexy here to tell you about my all time favorite brand we carry here at Super Cute. With Christmas right around the corner, it is officially crunch time to get your shopping done. Something I love the most is stocking stuffers. Stocking stuffers are, what I consider, all the things you never knew you needed. Our Natural Life brand carries the perfect little things you never knew you needed and would make for great stocking stuffers. Founded by Patti Hughes, Natural Life started as a photography company. Patti grew up watching her mother create gifts and work hard to make her dreams come true. This inspired Patti to start her own photography business of pictures of things that made her happiest. This soon evolved into keepsakes and gifts that people soon began to cherish. And so, Natural Life took off and grew into this wonderful company. All of their products are meant to inspire, motivate, and spread positive energy out into the world. Most items dawn a special quote such as “be happy” or “kindness matters”. Natural Life features so many amazing products that are all bright in color and sure to bring a smile to your face. Some of my favorite things are the boho bandeaus, which are wraps that can be worn 12 different ways, including as a headband or even a tank top. Another adorable item they sell are car fresheners. While this may sound not so super cute, trust me, they are. Each car freshener is dawned with a different visual and inspiring quote to go along with it, and they smell good too of course. I love that when I am driving all I must do is look up and immediately be inspired. They also carry adorable and comfy clothing. We love Natural Life’s night shirts that are oversized and super soft. Their lounge shorts are the perfect pair to go with. 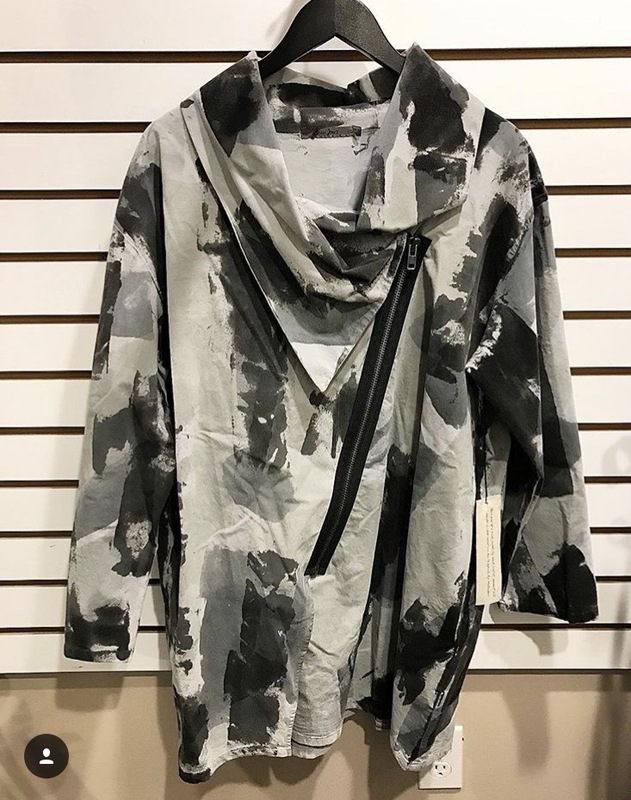 Not only do they sell comfy clothes, but kimonos, shirt dresses, maxi dresses, and t-shirts too! I love Natural Life clothing because you are always guaranteed to be comfy and stylish at the same time. Natural Life carries so many more awesome items that truly make for great stocking stuffers. Mugs, catch all trays, jewelry, chip clips, and phone pockets are just some of the adorable keepsakes that we carry. Crunch out the rest of your Christmas shopping and fill your stockings with Natural Life from Super Cute! Hi all, Lexy here. ‘Tis finally the season we have all been anxiously waiting for… Holiday season. I love the holiday season, but I especially love it at Super Cute. The whole store is full of cheer, excitement, and laughter. This year we have some amazing items for the holiday season. Every year, we have Tracey the tree fairy decorate our three trees. She uses a little bit of magic and suddenly they are twice the size and triple the sparkle. She really does a spectacular job and never fails to amaze us! This year we have a glam sparkly tree, and green, black, and white tree, and a traditional red and green tree. Each tree has beautiful ornaments, sparkly picks, and even a magic key for Santa to use. Something I always love during the holiday season is our kitchenware. I don’t know about everyone else but there is nothing I enjoy more than cozying up with a hot cup of cocoa in an adorable holiday themed mug. We carry so many adorable mugs, whether they be for travel or sit down. We also added beer glasses this year, as well as the typical wine glasses perfect for gifts. Another awesome kitchenware product we carry is platters. We have so many awesome holiday themed platters perfect for your holiday parties or gifts to friends. A new one we are carrying this year from Mud Pie is the cookie exchange platter. This platter is supposed to be shared with friends with sweet treats, and the platter gets passed along in exchange. It makes for a sweet gesturer, and of course, includes some sweet treats in the mix. Not only do we carry holiday kitchenware, but we have so many awesome decorations to make your home feel extra cozy this Winter. Whether it be garland, set around trees, signage, or something with just a little bit of sparkle, we have so many options. I especially love all the different signs we carry with family holiday sayings, or even comical sayings, and even signs that light up. The options are endless here at Super Cute and we are in full holiday spirit. Whether you are looking for décor or you are in need of gift inspiration, stop in to Super Cute and check out the awesome goodies we have this holiday season. Hi everyone, Lexy here. With Thanksgiving week finally here I wanted to give some insight into what this week has in store for Super Cute. With Black Friday and Small Business Saturday, we have some great deals and are excited for holiday shopping madness. This week is always a crazy one for us here at Super Cute. Personally, I have not even started. But I know you are all eager to shop at Super Cute this weekend and get a jump start on gift giving. Currently, we have thirty five percent off of four racks worth of clothing. This is such an awesome deal and so exciting. Whether you need a new outfit for your big family Thanksgiving dinner or need a gift for that best friend of yours, our clothing racks are where it is at! There is nothing we at Super Cute love more than busy weekends like this. We often brew hot mulled apple cider for all the customers to try. We make this with our own personal touch of mulling spices that we sell in store as well. We also set out dips for all our customers using our country home creations dips that are made right here in Michigan. These dips are awesome as appetizers, used in desserts, or even for soup. We love to make the customers feel at home and get as excited about shopping as we are. If you are in need of finishing touches for your Thanksgiving centerpieces or a special platter, we have you covered. Whether you need a turkey time platter to separate your white meat from the dark, or turkey napkin rings to get your guests in spirit, maybe even a floral arrangement for the center of your table. Whatever you need I am sure you will find this week at Super Cute. With Small Business Saturday coming this weekend as well, I have to say a shout out to everyone who chooses to shop small and local with us here at Super Cute. You are all so wonderful to this store and we are very grateful for that. There is something about this time of year that really makes you stop and feel lucky for the things you have, and I love that. We will be closed on Thanksgiving, but up and running on Black Friday and Small Business Saturday. WE cannot wait to see everyone’s shopping in full swing this week. We hope everyone has a great Thanksgiving with family and friends, and we hope to see you this weekend! Hi everyone. As we make our way through the many designated rooms of Super Cute, we have finally reached the bathroom/laundry room. As an avid user of aromatherapy and all things spa myself, this room is one of my favorites. A brand we just recently began carrying is Beekman 1802. Founded by the Beekman brothers who own a farm in New York, won The Amazing Race in 2012, and star on their own reality tv show – The Fabulous Beekman Boys, this brand of skin care products focuses on the use of botanical ingredients, including goat milk. We carry a range of body products, such as body lotion, soap, and even lip balms. Each come in a different refreshing scent and don’t leave your skin feeling oily. It is safe to say I am obsessed, especially with the hand cream! Another great line of items we carry is Hydraaromatherapy. This is the brand of our shower bursts and bath teas. These are great aromatherapy bath products that fizz up in the shower or bath, and leave you to relax to the many different aromatherapy cures. These include hangover buster, stress buster, and even headache buster. Coming from a person that gets frequent migraines, the headache buster is my favorite. Plus, I can vouge for the fact that they work! Relaxation isn’t only about body products though. We can’t have a laundry room without laundry products, right? Something we love is our Alpaca Dryer balls. These are dryer balls made with Alpaca fiber, soap, and water, and they are made right here in Michigan! These dryer balls are sure to make your clothing smell fresh and feel soft. Plus, they are a great way to save money on dryer sheets, and conserve for the environment! Lastly, our Greenleaf products never fail. Greenleaf focuses on home/car fragrances that are meant to embody the joy of every season of the year. With great scents and great products like linen spray, reed diffusers, and envelope sachets, these products are sure to make any place feel like home. They make for great gifts too! Whether you are looking for gifts or the perfect spa night for yourself and some girlfriends, the bathroom/laundry room is a must see. I for one can say this room is the most relaxing for me, all pun intended. Be sure to stop in and check out some of our products as you get your Christmas shopping started, and let us know what products are your favorite! Hi everyone, Lexy again. This week I want to talk all about some of our hidden treasures. As I have said before, we really try to carry a little something for everyone here. This means miscellaneous items are, of course, a necessity. We recently began carrying Girly Go Garters. These are garters that double as a on the go carry all pouch. Inside the garter is a line of rubber that prevents sliding. The garter has two rows of pockets. These pockets are perfect for carrying your phone, ID, or a little bit of cash when you’re on the go and don’t want to carry a purse. Another hidden treasure we have is our f’lint rollers. These lint rollers are perfect for on the go because they are compact and small. They are retractable and come in a wide range of colors. Nobody would ever know you are carrying a lint roller! A customer favorite is our car coasters. Car coasters are made to put in your cupholder in your car to not only make your car cute, but soak up the moisture from your cup! They protect your car and make for the perfect stocking stuffer. Another car related item we carry are blessing rings. Blessing rings are small keychains with sayings such as “safe driving – be cautious and aware, drive with care”, “coach – motivates, inspires, encourages”, and so many more. These keychains serve as a small reminder every time you grab your keys and will always bring a smile to your face. If you’re searching for something small but meaningful, we have a range of pocket stones and pocket tokens. These all have cute sayings such as “you are special”, “be true to you”, and “follow your own path”. Who doesn’t appreciate a small but meaningful positive reinforcement?! Whatever the occasion may be, we have so many hidden treasures here at Super Cute. Be sure to stop in and check out our items that would be perfect for stocking stuffers, or even a “just because” gift. Hi everyone, me again. This week I want to discuss one of my favorite clothing brands that we carry, Desigual. Desigual is based out of Barcelona, Spain. Their whole mission is to create clothing that is different and celebrates life. Every piece is certain to be unique, beautiful, and well crafted. Desigual is one of favorite collections to receive because we know every item is nothing short of amazing. This Fall and Winter they have made some beautiful clothing pieces that we are over the moon about. For example, we have some awesome, thick knit cardigans that are perfect for a brisk Fall day. My personal favorite is the grey denim jacket with knitted sleeves, or the salt and pepper vest with a fur collar and knitted sleeves. We also carry some awesome jeans from Desigual. These jeans are comfortable, unique, and super flattering. My favorite aspect is the beaded bottom and adorable pockets. 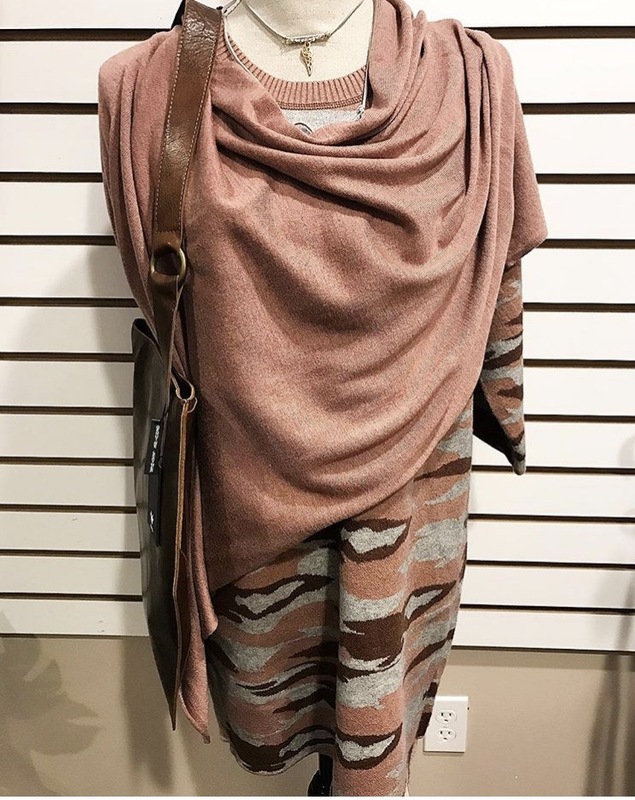 If you’re in the search for something a little fancier, there are some great dresses that would be perfect for a fall or winter wedding, or, if you’re looking for something more casual, there are adorable tunic dresses too. Desigual does not only make clothing, but some beautiful accessories too. We recently got in the most adorable bags. I am obsessed with them, seriously. In either a bucket or crossbody shape, the handle is made from a scarf turned belt. So when you’re in the need of something bright to spice up your outfit, you can detach the strap and wear it as a belt. We love Desigual because everything is so bright and uplifting. You are guaranteed to smile when wearing this clothing and feel beautiful from the inside and out. Make sure you come check out everything we carry from the Desigual line and spice up your wardrobe for the coming season. Hello all. Me again to tell you even more about Super Cute. Will I ever run out of amazing things to say about this place? Probably not. This week I want to talk all about our anniversary and Fall. Fall is very quickly approaching and we could not be more excited. I feel like we have waited an eternity for this! We love this time of year because it means we have approached yet another amazing year of Super Cute. Any time the season changes is an exciting time at Super Cute. During Fall, our displays change, the amount of clothing we have grows, and we all get extremely excited. There is just something about Fall that is so cozy and heartwarming, and we love that. We set up a display with a unique mix of Halloween and Thanksgiving décor. Whether its baby costumes, platters, or simple fall décor, we carry a mix of everything. The best part of Fall at Super Cute is our clothing. We sell so many unique and truly beautiful pieces. 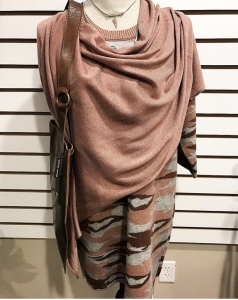 This year, we have so many awesome knit pieces such as sweater dresses, cropped sweaters, and blanket scarves. A never ending fall trend is flannels, and we have got plenty. Some with crochet designs some in tunic styles. They are so cute and cozy! For the colder nights, we have stylish yet wearable coats and jackets, which are my personal favorites. Whether you like a light jacket to layer with or a thick, heavy winter coat, we have it. Fall is a truly magical time here. The look of the store changes, the feeling is heartwarming, and we get excited because our anniversary comes! This year, September 4th was our third year anniversary! We are so excited to celebrate another year of Super Cute. Be sure to stop in to celebrate another year of Super Cute, shop for fall, and boost your wardrobe for the weather change! Hi everyone. This week I want to share with you some of the awesome kitchen items we sell here at Super Cute. Something we strive for is to carry unique and, quite literally, Super cute items. Our kitchen section of the store is one of my favorites because we carry so many cool items. One of the most unique brand of items we carry is Dreamfarm. Dreamfarm is a company from Australia that focuses on creating unique and useful products. Some items we carry and love are the scizza, which is a pizza cutter shaped like scissors to perfectly cut pizza. The supoon is a silicone spoon that scoops, measures, and scrapes bowls. Lastly, my personal favorite, we have the chopula, which is a spatula thin enough for flipping and strong enough for chopping. These items, plus many more, are oddly useful and so out of the box. We have a large selection of mugs, wine glasses, pint glasses, and cups that are perfect for gifts. A customer favorite is our Corkcicles, which are comparable to Yeti but colorful. These tumblers are triple insulated and vacuum sealed cups that keep your drinks hot or cold for hours on end. Another favorite is Presse by Bobble. These are brew, press, and go coffee cups that allow you to freshly brew and drink your coffee from the same cup. These cups are made for people in a hurry that can’t survive without their morning coffee… aka, me! The most popular brand of gifts we carry is by far our Mud Pie platters. These platters are perfect for any occasion and come in a variety of shapes, sizes, and puns. For example, we carry a margarita plate that says “squeeze me baby one more lime” and “hit me with your best salt”. Another example is the dip bowls that say “just in queso” and “nacho ordinary salsa”. It is the puns that make these platters so awesome and the perfect gift. Whether you are looking for gifts or need something special to spice up your kitchen, Super Cute has it all. Make sure you stop in and check out our kitchen items to see for yourself! It’s me again, Lexy, to tell you more about Super Cute. One of the awesome things about working at a local business is getting the opportunity to see some of the amazing talent locals have. The local vendors we work with are truly talented, amazing people. There is a wide variety of Michigan items from local vendors that we sell. For example, a customer favorite has always been Willow Creek Candles and melties. They make the perfect gift, whether it be for yourself or a friend! We love Lisa Larson’s artistic Michigan signs, mugs and coasters, making for the perfect home décor. Another local candle line that we carry is Heidi’s Happy Hour Scents. She has some very unique scents and is always creating more. My personal favorite is a book called Benson’s Seasonal Adventures, which is written by Tracy Foster and Shannon Cooper – Toma. It explores the many unique places and facts of Michigan. There are so many Michigan vendors that we carry truly unique items from. Our Michigan room is full of awesome items ranging from home décor, clothing, kitchenware, and even marshmallow roasters. We at Super Cute love so many things about Michigan. If you love the great lakes, a weekend up north, just the shape of Michigan, or just the many quaint towns, this is truly a unique and special state that we hold near and dear to our heart. Make sure you come check out our Michigan room to see it for yourself! Hi everyone! Lexy here again to tell you more about the amazing boutique I work at, Super Cute. One of my favorite things about Super Cute is how unique every item really is. To be specific, an item that has always caught the eye of not only myself, but customers, is our Giving Keys. 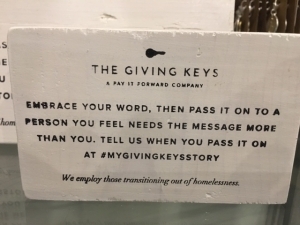 The Giving Keys is a pay it forward company based out of Los Angeles, California. Employed are people transitioning out of homelessness in need of a full time, stable job. Each piece of jewelry purchased plays part in creating a job for someone in need. 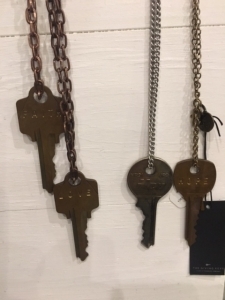 The Giving Keys are jewelry pieces made from old donated keys with meaningful words engraved on them such as brave, inspire, and dream. The point is basically to take what you need, and then pay it forward. So, when buying your key piece, wear it until you find someone who needs that inspirational word more than you do, and then pass the jewelry piece on to them. This company and their whole mission is truly powerful. Their website says that their “core values unite us around our mission to pay it forward and remind us of the truth about ourselves: that who we are tomorrow is not deﬁned by who we were yesterday, and that with intention and hard work, we can create a future that is brighter than our past”. 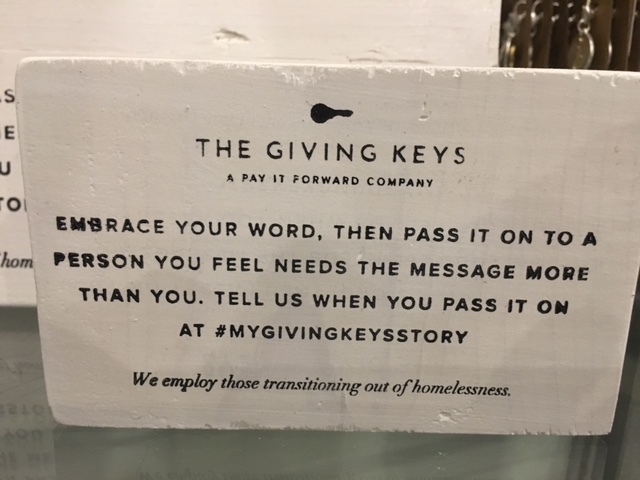 Whether you are in need of some inspiration or you are looking for a truly meaningful gift, The Giving Keys are the perfect choice. These pieces really are heart warming and sentimental and an all-around favorite for us at Super Cute. Hello all! My name is Lexy and I am here to tell you all about the amazing boutique I work at, Super Cute. I hope you find these posts to be as informative and real as I try to describe how magical this store really is. Small town Freeland, Michigan has always been a place people knew for good football, delicious bar food, and a tightknit community. Right in the middle of Midland, Saginaw, and Bay City, a drive was always necessary to ever buy a gift or shop until you drop. When word got around in 2014 that Kara Ellis would be opening a small boutique called Super Cute, all of that changed. Kara has always had a lifelong dream of owning her own business. While what type of business it would be was always a mystery, she always knew it was one of her life goals. 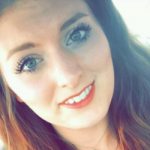 After spending 17 years working at Dow Chemical, one day it hit her that she wanted a job where it felt like she wasn’t even going to work every day. With the push from her husband Steven to start her own business, they decided then and there was the perfect time to start. From that point on, she worked hard to brainstorm and create this beautiful place we call Super Cute. Knowing that our community needed a boutique style store, she found inspiration through her own knack for home décor, and went from there to expand into clothing, gifts, and accessories. Super Cute is more than just a small boutique. We have gifts for every occasion, home décor, clothing, jewelry, and so much more. The possibilities are endless. While we ironically too often hear the comment that we have too much merchandise to look at, that is the goal. We aim to have something for everyone and every event. The chances someone comes in here and doesn’t find a single thing they like is, well, nearly impossible. We want customers to feel inspired and motivated to finish the decorating you started but never finished or surprise a friend with a thoughtful gift. Whatever it may be, there is a little something for everyone at Super Cute. Kara has worked hard to make this a place everyone can love as much as her. What started out as a dream has grown into a reality for her that we cherish every day. Stay tuned for more about Super Cute, our vendors, and some of our truly fascinating items!